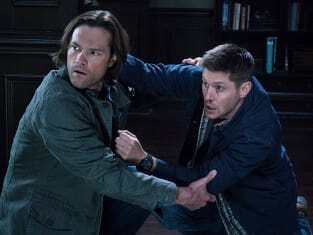 It’s not too surprising that Supernatural Season 11 Episode 11 turned things down a notch after the intense cage match on Supernatural Season 11 Episode 10. Granted, the hour still managed to touch on some of the bigger story aspects when it came to Sam, Dean and Castiel, but ultimately, the focus was on the case of the week. And we finally learned all about Sam and Dean’s affection for the Golden Girls. There weren’t many twists when it came to the banshee, which was a very straightforward monster of the week. The banshee was evil, and there was not much else to the creature. I do wonder about the decision to make the banshee all CGI. It was rather jarring to watch. Yes, it was great to see a real monster face off with the brothers, but it would have had a far better impact if it was an actress with some solid makeup work. I couldn’t help but think about how fake the banshee looked each time it appeared. Though, I did think that Mildred had something to do with the banshee or was controlling it. She just seemed suspicious. Instead, she was a part of the comic relief, and it was humorous seeing her flirt with Dean, even suggesting she could move her hand higher if he wanted. But the most positive part of hunting the banshee was the introduction of Eileen. Not only did we get a brand new hunter, but we got plenty of backstory to her character and her motivations. It certainly helped that her mission felt very parallel to the journey that Sam and Dean had taken. It was great to see her talk about growing up a hunter and that even after getting her revenge, her life as a hunter wouldn’t end. That is just who she is. It really does make you wonder about the rest of Sam and Dean’s journey. Will they get to retire or will they go out in a blaze of glory? If anything, keeping them united has been a fantastic choice for the season rather than splitting them up over some ridiculous drama. Sure, Dean’s keeping secrets about his Amara connection, which definitely seems to worry him even more now, but I was pleased to at least see the brothers get to have some real conversations. Sam apologizing about not coming to find him after Purgatory was a big moment for Sam, but it was great to hear Dean tell Sam not to worry about it. The past is the past, and it’s such a welcome thing to see that even with the brothers dwelling on certain things, they are still trying to push forward, together. The road forward certainly won’t be an easy one, but with Sam and Dean working together, that victory seems far more viable. Yet, the whole Castiel/Lucifer angle may throw a wrench into all that. And I’m glad that the hour didn’t skip over giving us some time with the character. Misha Collins doing his Mark Pellegrino Lucifer impression still feels spot on, but I enjoyed seeing him have to make his Lucifer do a Castiel impression. It was just enough different to make it still feel slightly like Lucifer, but enough like Castiel. But what the heck is he up to? He could have killed Dean right there, but he didn’t. And was he really after some lore on the Darkness? I’m very curious as to what Lucifer’s true plans are. What did you all think? Did you enjoy the case of the week? Will Eileen return? And what’s Lucifer up to? Sound off below. 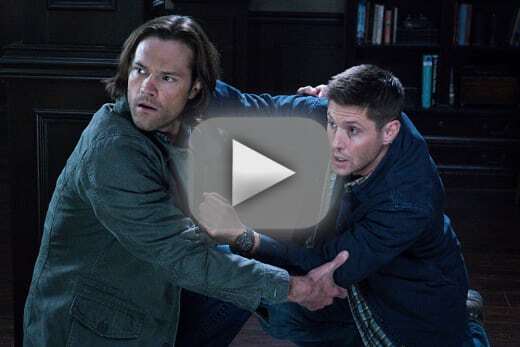 Plus, make sure you watch Supernatural online right here at TV Fanatic! NOTE: Supernatural Season 11 Episode 12, "Don't You Forget About Me," airs February 3 at 9/8c.